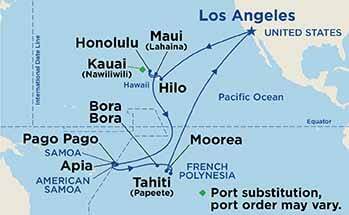 You are here: Home >Special > 29 Day South Pacific Cruise Roundtrip Los Angeles - From $2999 US! 29 Day South Pacific Escape! For a taste of the exotic South Pacific, Princess Cruises will take you farther south from Hawaii to the South Pacific's island nations where life is simple; customs and rituals of ancient cultures are still revered. Princess Cruises caters to those seeking a complete escape from the stressful routine of daily life by being the consummate host in the world's most beautiful setting - the South Pacific! This itinerary features a 29-day cruise with 8 ports of call, including visits to Hawaii, French Polynesia and Samoa. Meals and entertainment are inclusive. Don't delay booking this unique South Pacific cruise now! 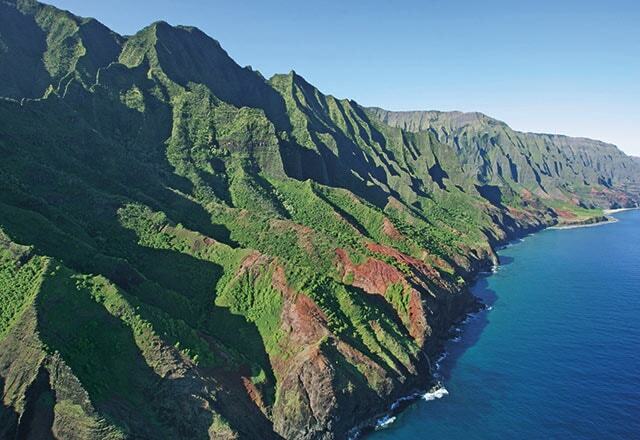 Kauai - The fourth largest island in the Hawaiian group, Kauai is known as the Garden Island. The terrain ranges from the volcanic slopes of Mt. Waialeale and the desert-like beauty of Waimea Canyon to the Wailua River's lush Fern Grotto. Oahu - Home to nearly half a million people, Honolulu is Hawaii's state capital and only major city. The city of Honolulu and the island of Oahu offer a wealth of historic, cultural and scenic attractions. Waikiki Beach and Diamond Head are two of the city's enduring symbols. Pearl Harbor, site of the USS Arizona Memorial and the Punchbowl, are haunting reminders of the tragic events of 1941. Hawaii - The Big Island of Hawaii is a paradise of black-sand beaches, tropical rainforest and volcanic mountains. Mauna Loa, the largest mountain on the planet, soars above the bleak lava fields of Hawaii Volcanoes National Park. Pago Pago, American Samoa - Pago Pago Bay is one of the most dramatic harbors in the South Pacific, a region known for dramatic landscapes. Eons ago, the massive seaward wall of a volcano collapsed and the sea poured in. Today, dramatic mountain peaks encircle the deep harbor. Apia, Western Samoa - The first Polynesians arrived in Western Samoa around 1000 B.C. Three millennia later, the islands formed one of the last bastions of traditional Polynesian culture. Apia, the capital of Western or Independent Samoa, is a city of 40,000 on the island of Upolu. Its picturesque waterfront is lined with public buildings, shops and trading companies. Bora Bora - Majestic mountains sculpted by ancient volcanoes, a shimmering lagoon and a barrier reef dotted with tiny motu, or islets - welcome to Bora Bora, perhaps the most stunning island in the South Pacific. Only 4,600 people live a seemingly idyllic lifestyle in the main villages of Vaitape, Anau and Faanui. Moorea - Moorea, the former haunt of Tahitian royalty, is one such island where you still see fishermen paddling outrigger canoes, pareo-clad women strolling along the roads and children fishing from island bridges. Moorea is an island of vertiginous mountains - most of its 18,000 people live along the narrow coastal shelf. Tahiti - Tahiti is not just an island - Tahiti has always been a state of mind. The bustling capital of Tahiti and her islands, Papeete is the chief port and trading center, as well as a provocative temptress luring people to her shores. All pricing above is in US Dollars, per person. Port charges & taxes are additional. Pricing is based on two people sharing and subject to availability. The "From" price listed on our website is for the April 11th departure date; other dates may have different pricing, please inquire. All pricing is based on availability and subject to change by the cruise line at any time. For more information please contact one of our Tahiti Specialists!